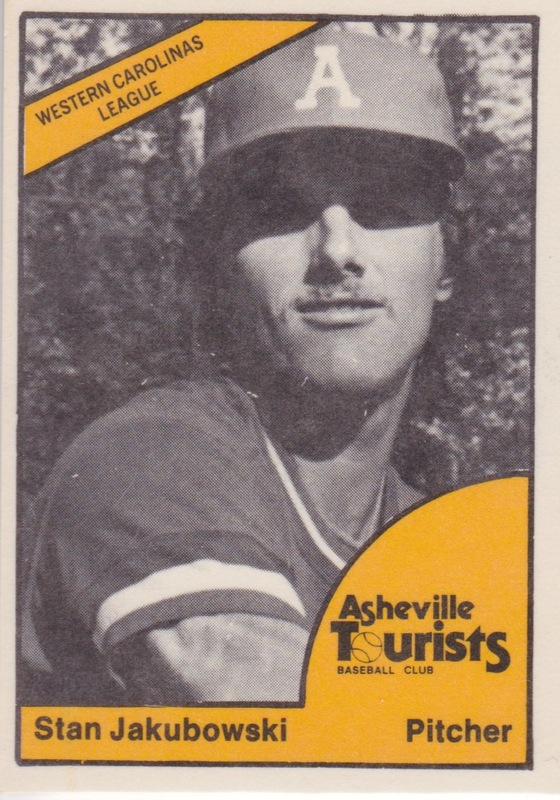 I covered the Spartanburg Phillies (and Mr. Zip) last week, but they're not the only Western Carolinas team TCMA successfully pitched for 1977 team sets. Asheville (NC), famous for its Vanderbilt estate, picked up Anderson's former SC team in 1976 and renamed it the Tourists, a name that both reflects their main business and evokes the roving life of many minor league franchises. 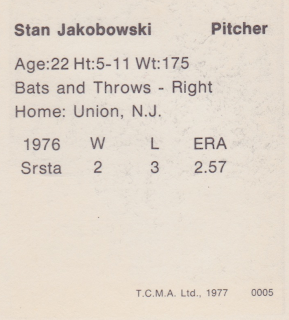 Stan Jakubowski played six seasons in the minors, including AAA stints in Tucson (1979) and Wichita (1980), without making a big league roster (career stats). At least he didn't stick around Tucson long enough to get tagged with these fashion disasters. 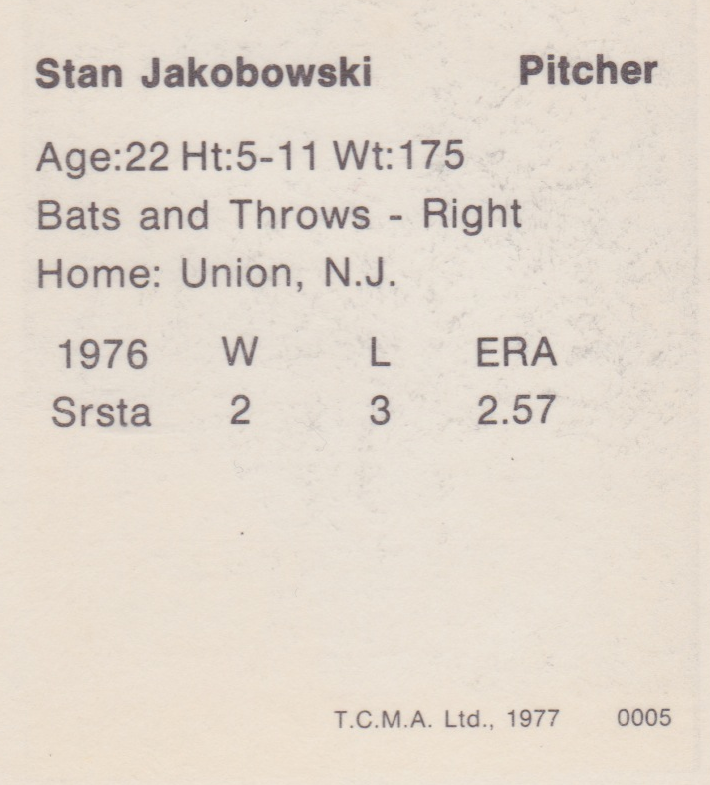 Most online checklists alphabetize this 1977 set, despite the ordering visible on card backs (005). TCMA varied their numbering methods, even within years, sometimes using type small enough to look more like a printing note. Here's what I know for set numbering, based on back scans. Let me know if you've got more to fill in! Other players in the set (numbers unknown). UPDATE: Tucson's 1980 uniforms finished second to the Colorado Caribous in Worst Uniform Ever by fan voting on Uni Watch's blog. First check out the horde of Nominees and then the voting results. Value: I bought this #5 for $2.50 at MinorLeagueSingles.com and the team set runs $15-20 at eBay. Somebody spent too much time in the Arizona sun, and thought to themselves, "How can we combine the two most awesome uniforms, the Padres and Astros, and make an epic new uniform for the Toros? ", and came up with that monstrosity pictured above. 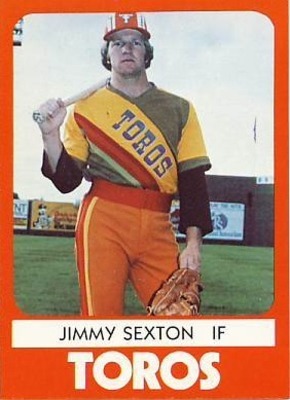 It's funny, I hated Houston and San Diego's unis as a kid but kind of like seeing them in throwbacks now, in a nostalgic sort of way, but those Toros uniforms just take it to a whole other level. Holy crap, that Toros uniform is insane. Did they hand out shades to fans when they came in the gates? I can't imagine seeing 9 of those things all at once without retina damage. Updated the post with links to the Uni Watch voting on worst-ever uniforms. There was one even more terrible than Tucson!